4Videosoft DVD to Sansa Converter can convert DVD to Sansa MP4, convert DVD to WMV, AVI for other devices and rip DVD movies to Sansa MP3, WMA, OGG with lossless output sound and image quality. Ripping DVD to Sansa with 4Videosoft DVD to Sansa Converter is as easy as winking now! That¡¯s to say, you can convert your DVD movie to Sansa MP4, even to iPod, iPhone, PSP, etc. Moreover, 4Videosoft DVD to Sansa Converter gives you access to extract DVD movie to Sansa MP3, WMA, WAV, OGG with lossless output sound and image quality. 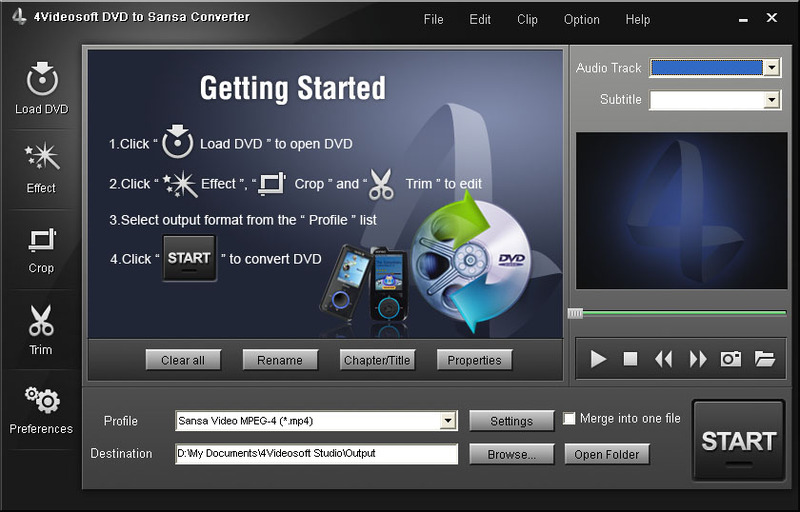 What's more, more editing functions was integrated into 4Videosoft DVD to Sansa Converter, such as trim you want video length, crop the video play region to suit your Sansa, merge several files into one, edit the video effect, take snapshot when preview, select audio track and subtitle, etc. 4Videosoft DVD to Sansa Converter allows you to adjust the video effect: video Brightness, Contrast, Saturation and check Deinterlacing to upgrade your video quality by using the Deinterlacing technology - eliminate some jaggedness from the interlacing video. 4Videosoft DVD to Sansa Converter has the trim function. It means that you can get any time-length video clips from your DVD movie. Adjust the size of DVD video play region and the output aspect ratio to get the perfect playing effect on Sansa. 4Videosoft DVD to Sansa Converter provides the easy and convenient function of inputting one DVD and output more different video or audio formats at one time conversion. 4Videosoft DVD to Sansa Converter is really easy to use. The whole process of conversion can be finished in few clicks. All the parameters of profile can be provided for you to choose the exact settings for your players with the assistance of 4Videosoft DVD to Sansa Converter. Edit Video Settings, and choose you player suited Video Encoder, Resolution, Frame Rate, Video Bitrate. Input you need Video Resolution in the form of Width(pixels)*Height(pixels), along with the Audio Settings adjusting: Audio Encoder, Sample Rate, Channels, Audio Bitrate. All settings can be saved as user-defined profile in prepare for future use. By using this DVD to Sansa Converter, you can preview both the DVD original video and output video effect at the same time. To personalize your video, try to add watermark in the form of picture or text with customized transparency and position in your movie.